Spinmaster has really launched an all-out assault on the Target toy aisles this week with their Tron Legacy line, taking a page from Hasbro's book with the variety of different scaled offerings from which we have to choose. I'm always a sucker for diecast, as should be any self-respecting toy enthusiast, so their affordable and stylish line of 7 vehicles in diecast wave 1 is a great bargain at $3.99 a piece, and a great set of collectibles. 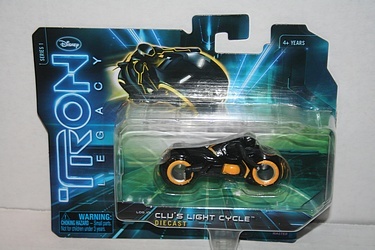 Today let's take a look at Clu's Light Cycle, high-speed vehicle of the ruler and villain of the Tron system. Watch the Preserve for more entries in this diecast line, or get yourself down to Target now to pick up your favorites!